We helped AstraZeneca communicate the value of doing the right thing with a bright and colourful animation that helped instil a deep sense of responsibility amongst employees. Animated internal communications can be one of the most effective and invigorating ways of connecting with your employees in a way that will make your message stick and trigger positive action. Following a refresh of AstraZeneca’s Code of Ethics, our client wanted to communicate the changes – a reflection of “a new AstraZeneca” emerging – which saw the document evolve from a very comprehensive 100-page document to a distilled six pages. The animation needed to remind employees of the importance of the corporate ethics code, and how it’s vital for everyone to remain committed to it. This commitment will enable AstraZeneca to continue to operate within the Law, and to improve patients’ lives. “Would my manager and I like reading about it in tomorrow’s news?” – that is one of the questions AstraZeneca employees are encouraged to ask themselves if they’re having difficulty making a decision. The animation transmits the significance and weight of that question with energy and an overall sense of optimism and freedom, always within the values defined by the Code of Ethics. The animation reminds employees that AstraZeneca trusts them to make courageous decisions and choices, and that the company acknowledges that every single employee makes a difference. The corporate Code of Ethics exists to make staff feel empowered to make the right decision and instil a sense of ownership and responsibility. We achieved this by maximising the use of colour against a white background and injecting energy and movement. 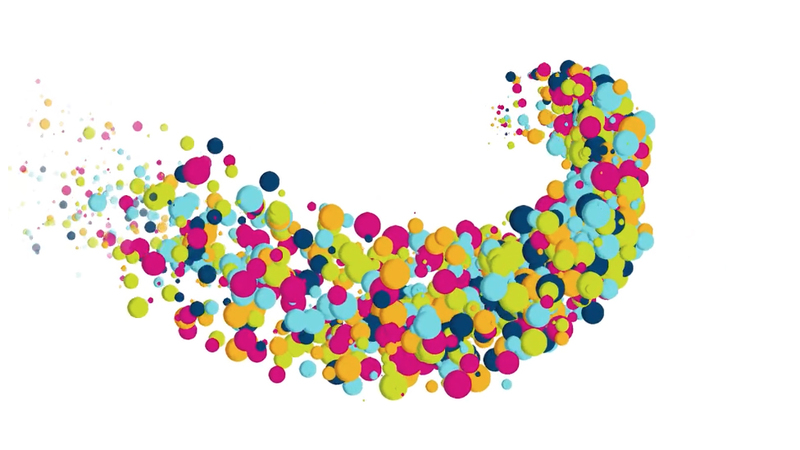 Bubble-like shapes in the different AstraZeneca brand colours signify individuals within the organisation, and the strength of them coming together and working as a team. Combining Adobe After Effects, Cinema 4D and Trapcode Particular, the bubbles form into a fluid shape that introduces different topics and also help frame content. Black and white images representing employees and patients add gravitas, helping the audience associate the Code with the responsibility that comes with making decisions that will impact patients, colleagues, and the company as a whole. The music track choice – calm, serene and optimistic – perfectly suits the message being communicated: all will be well if we do things the right way, if we all abide by the Code of Ethics. This example of animated internal communications has been edited to protect client confidentiality.